As used by some of the world's top engine builders, the Terrafirma foam air filters are produced by Pipercross, leaders in foam filter technology. The filters are a direct replacement for the original paper element but giving 30% more air flow and a life time washable air filter without an increase in induction sound. When airbourne dirt particles are trapped by a standard paper or cotton filter there is a reduction in air flow and power. With the high performance deep foam construction of the Terrafirma foam filter, air is able to bypass the trapped dirt and thus maintaining the air flow and power. Independent testing at MIRA has proven that pipercross foam has the ability to hold more than twice the dust particles than that held by other types of filters. 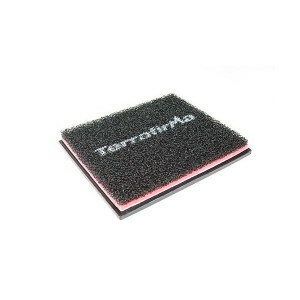 When the Terrafirma foam filter finally reaches its full dust capacity it can easily be cleaned using the cleaning solution and re-oiled as required. Servicing could not be easier. Terrafirma offers offroad foam filters for the most popular Land Rover models, service fluids and a unique Snorkel sock to reduce dust intake on raised intake systems. Please use Terrafirma Pipercross fluids when servicing Foam Filters to prolong lifetime and effectiveness. Why Terrafirma Pipercross Foam Filters? This listing is for a Land Rover Defender and Discovery Td5 from 1998-2007 only.